Auvita Rapilla, the secretary general of the Papua New Guinea Olympic Committee (PNGOC), has been presented with a book by Alurigo Ravusiro, a member of staff at the organisation. Ravusiro is one of 45 women who have contributed articles to the new book, which is called "My Walk to Equality". The book is a collection of anthologies in story and poetry form. 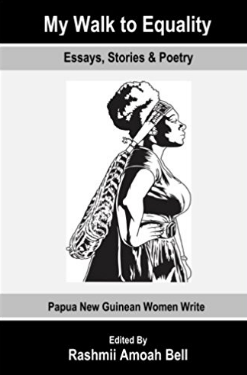 "The anthologies are raw and emotionally arresting with strong stances about the development of our nation," Ravusiro said. Ravusiro added that the passages speak of women and the "choices they made, or could not", and "indirectly asks policy makers to consider the experiences to make informed decisions". She wrote two short stories and two poems in the book. One of the articles is based on her experience working with the PNGOC. "A Culture of Family was inspired by the PNGOC culture - how we can bring in children and let them be 'at home' while they wait for you," she added. "These moments are most powerful as children learn from us - what we do, how we relate, how we communicate et cetera, by observing and even participating. "It is our story as seen through their curious eyes." Rapilla is also an International Olympic Committee member.